I’ve partnered with Veal Made Easy to bring you this delicious recipe! If you’re like most people, myself included, you usually begin each new year with a commitment to eat healthier. Sometimes you’re successful, sometimes less so, but what definitely makes a huge difference in the success rate is having access to healthy food that actually tastes good. And as the saying goes, we eat with our eyes first – which means healthy food also needs to look good to be appetizing. These Thai Lettuce Wraps have you covered on both fronts. 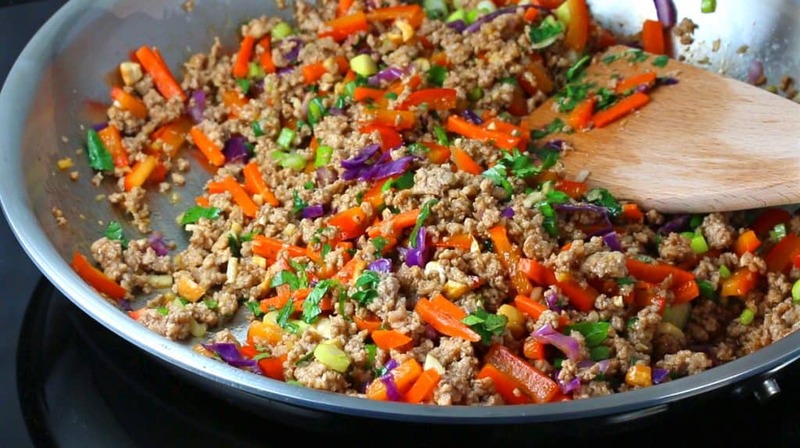 Visually beautiful with its vibrant colors and positively bursting with FLAVOR, you’re going to LOVE the filling that goes into these lettuce wraps! 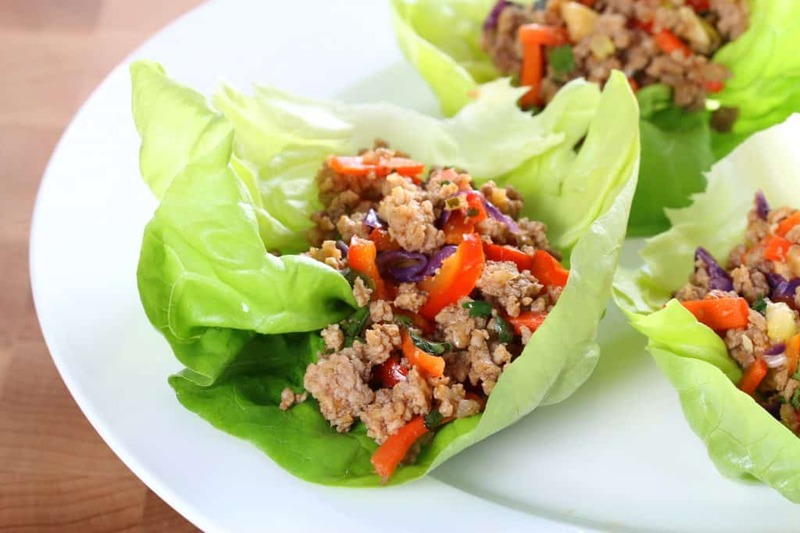 Plus these Thai-inspired lettuce wraps are quick & easy to make, are low carb, low calorie, low fat, gluten-free and paleo! 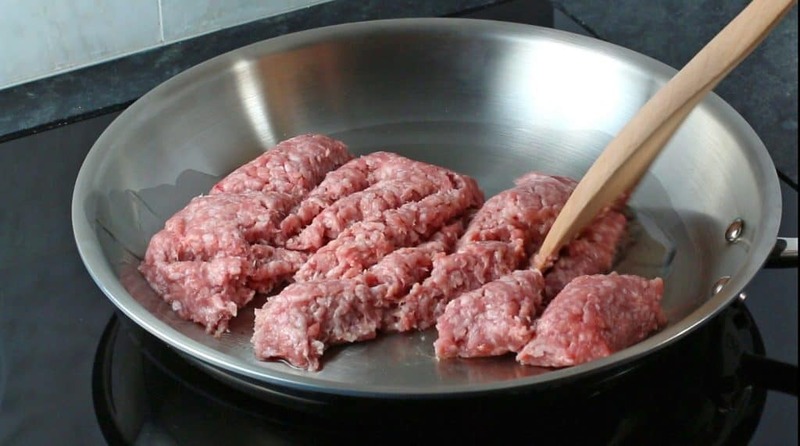 We’re using ground veal for these wraps. Veal farming in U.S. has made a lot of positive changes in recent years where the cows are responsibly raised in group pens where they can socialize and receive veterinary care. Many farmers also choose to pasture-raise their cows. For more information about veal farming in the U.S., visit Veal Farm. Veal is prized among chefs worldwide for its versatility (substitute it for any dish that calls for meat), flavor (wonderfully mild), and delicate texture (smooth and melt-in-your-mouth) and nutrition profile. Veal has a lower calorie and fat profile than beef and the USDA recently revealed that a 3 oz. serving of cooked, trimmed veal provides less than 10% of the calories recommended for a 2,000 calorie diet while simultaneously providing more than 10% of the daily values for protein, niacin, zinc and vitamins B-12 and B-6. Read more about veal’s nutritional profile. For more great veal recipes check out our Hungarian Meatballs, Grilled Sweet & Sour Veal Meatball Kabobs, and Milanese Philly Cheesesteaks and Grilled Veal Steak Fajitas! Still hungry? For even more great veal recipes, check out more great veal recipes at VealMadeEasy! First make the sauce. This can be made well in advance and refrigerated until ready to use. 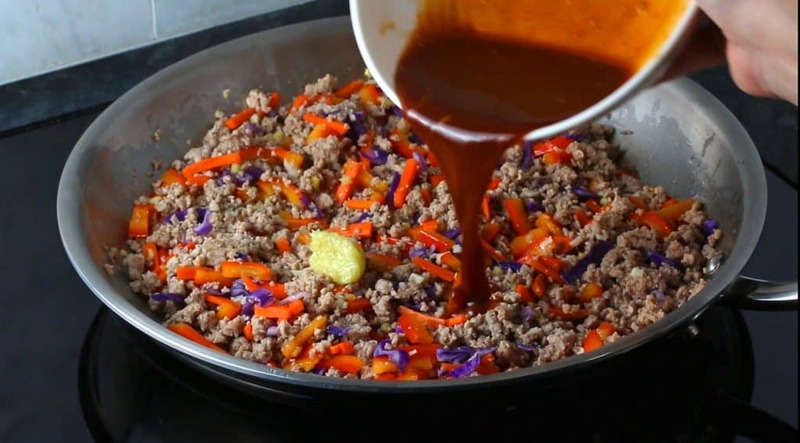 In a bowl, add the lime juice, soy sauce, Thai red curry paste, sesame oil and sriracha (if using). 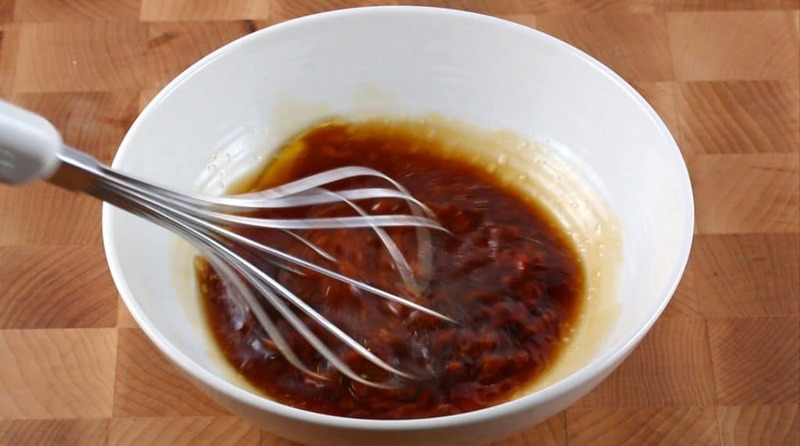 Whisk to combine. 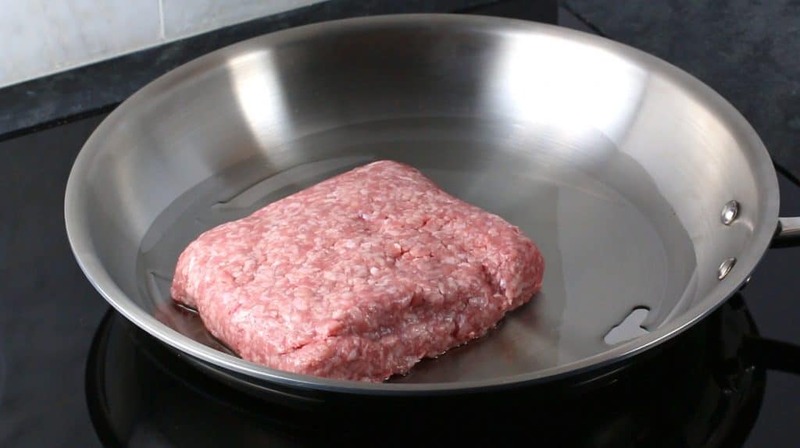 Heat some oil in a skillet and cook the ground veal until no pink remains. Drain the liquid. I’m using my 7-ply American Clad 12″ Fry Pan from Hammerstahl. Check out my full review. 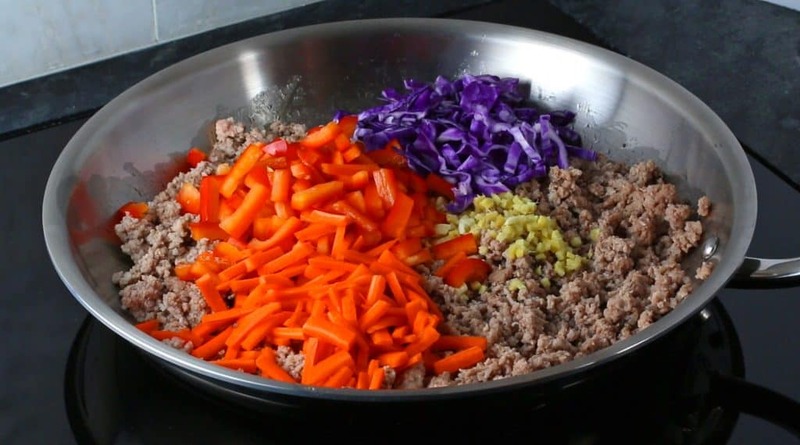 Add the shredded red cabbage, chopped red peppers and carrots, minced garlic and ginger and cook for 3-4 minutes until softened but still retaining some crunch. Add the sauce and lemongrass and cook for another minute. 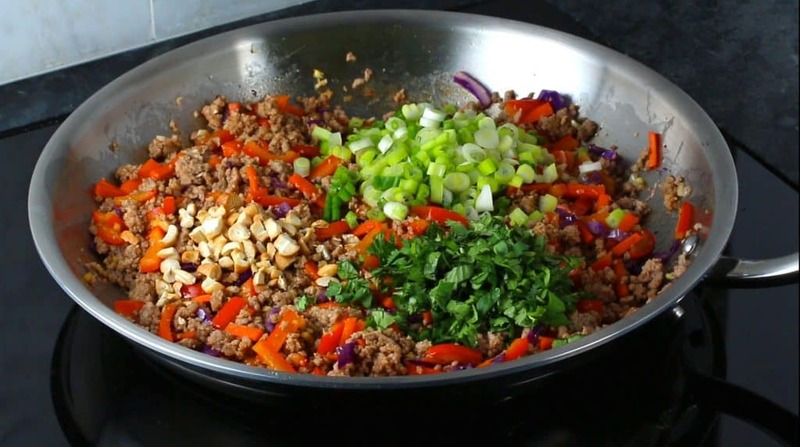 Add the chopped nuts, green onions and cilantro and cook for another minute. You’re done! Now it’s time to stuff. Note: This filling can be made in advance as well and reheated. Lay the bibb lettuce out on a serving platter on individual plates and spoon some of the filling into each leaf. 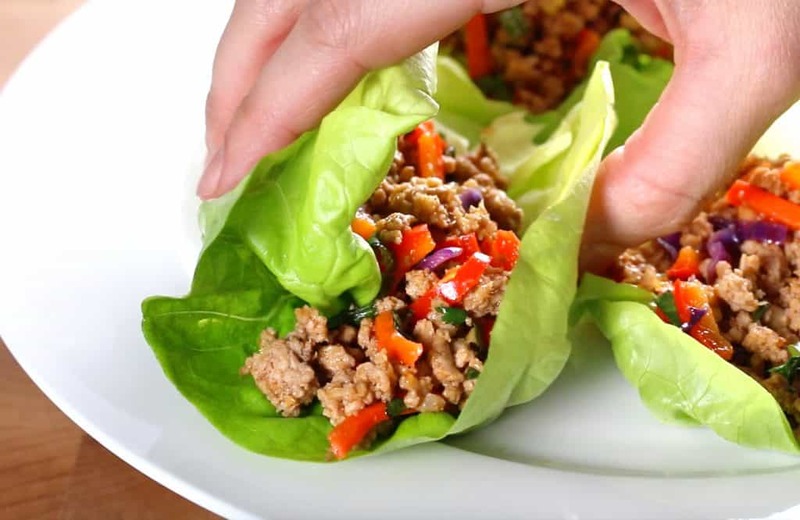 The Thai Lettuce Wraps are eaten by gathering them up with your hand. Perfect as a healthy entree, lunch, appetizer, hors d’oeuvres or for entertaining! Be sure to enter the Veal sweepstakes to win $150 in FREE groceries! Ends March 29, 2018. 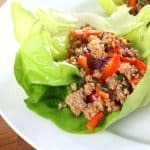 Positively bursting with delicious flavors, these Thai Lettuce Wraps are quick and easy to make and are low carb, low calorie, low fat, gluten free and paleo! 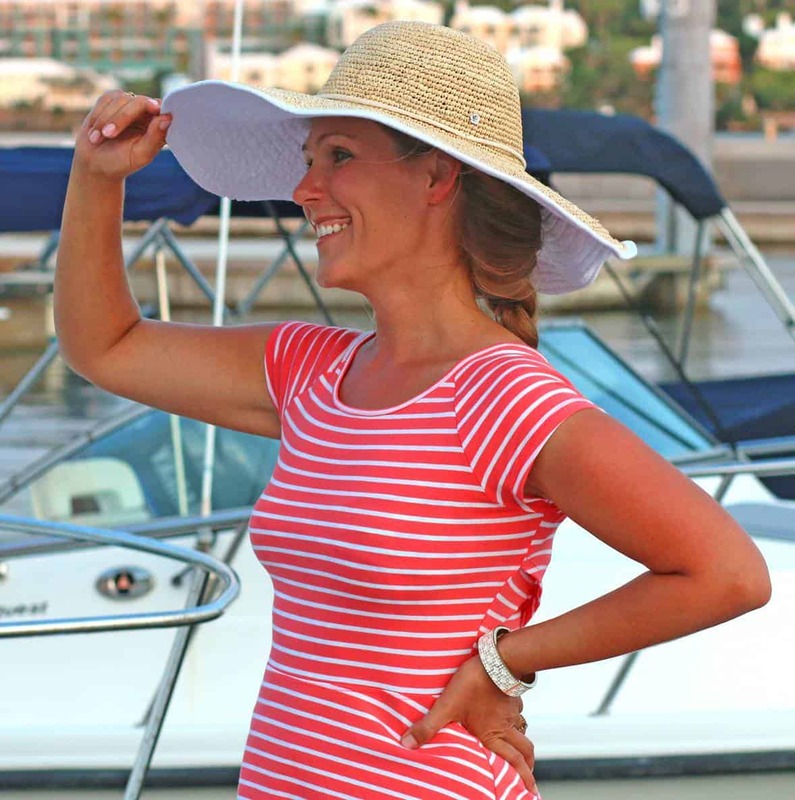 Perfect as a healthy main course, lunch, appetizer, hors d'oeuvres or for entertaining! Thank you to Veal Made Easy for sponsoring this post. One of our favorite apps to order when we eat out. Love all of the flavors! Veal is so buttery in flavor, and this looks amazing! I love light and healthy dishes like this! This is my type of dish! Looks absolutely fantastic! 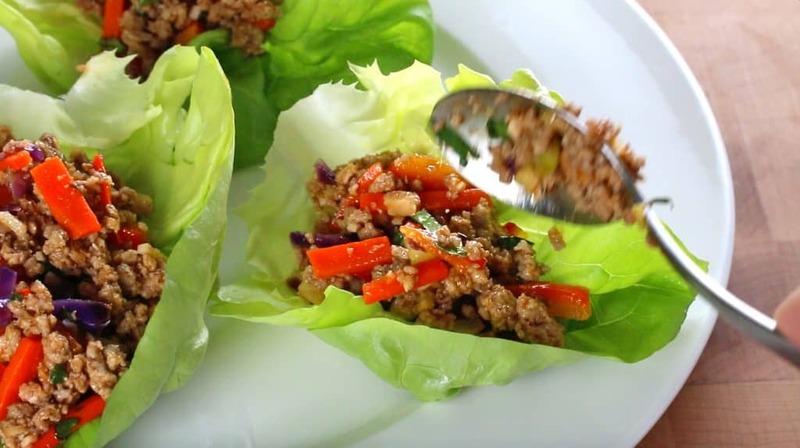 I’ve recently discovered lettuce wraps and I will be adding these to my list of go-to’s. I love a healthy, low-carb dinner. These look really easy and delicious. Loving all of the veggies in them. Light, healthy, and delicious! Count me in! Gorgeous!! These sound SO delicious and I love veal, will be making these soon! I’ve never tried lettuce wraps with veal before. My husband is going to be so excited! He absolutely loves veal! This is such a beautiful and fresh dish! It needs to happen in my kitchen soon! These look delicious and so easy to prepare! A perfect healthy dinner idea. These look amazing! Definitely a recipe my whole family will enjoy! I love Thai food and I love lettuce wraps. These two combined I am sure will become a favorite of mine. These look so good, and I love those vibrant colors! These would be a huge hit in our house! These were EXQUISITE! We had a few friends over last night and I made these. Everyone loved them, so flavorful, SO good! Do you mean ‘pasture-raised? Pasteurized-raised doesn’t make sense. Excellent recipe, I made these for a light dinner this evening and my husband and I both loved them. Thank you! Wonderful, Cathy, thanks so much! 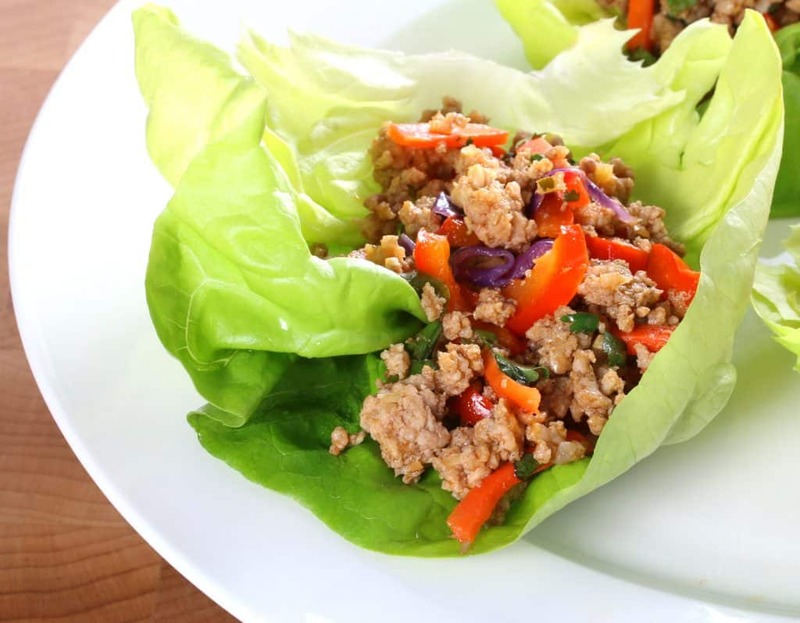 Lettuce wraps are a favorite of mine. I can’t wait to make these. These were DELICIOUS!! I followed the recipe exactly as written. Will be making these again, thank you! Wonderful, Cami, thanks so much!